Potential investors should pay attention when Dr. Andrew Schiller says the team behind his website, NeighborhoodScout, is predicting that 2019 will see a mild cooling off in the real estate market. Schiller and his team have a strong track record when it comes to these kinds of predictions — recently, they anticipated the recent Denver real estate market decline and posited that the Las Vegas housing market would rise to become the nation’s highest appreciation metro area. NeighborhoodScout’s data provides valuable information to help investors make decisions about real estate. No, Schiller is not a real estate wizard. He is simply drawing logical conclusions from the data that he and the NeighborhoodScout team aggregate, sort, and build. Schiller, who is a Ph.D. geographer and the Founder and CEO of Location, Inc., created NeighborhoodScout in 2002 after his own experiences moving from town to town for jobs or school. He would elicit housing recommendations from friends or real estate agents but was never satisfied with the advice, often after committing to a lease or mortgage, he told Inman News. 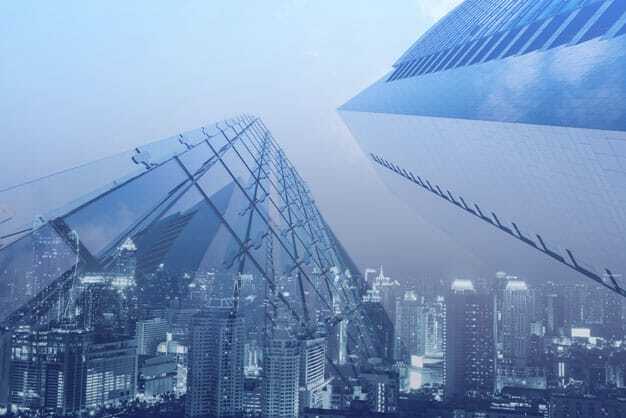 Today, the website has grown to be a valuable tool for real estate investment firms, lenders, large corporations scouting new locations, real estate agents and brokers, and individual home buyers and sellers. And, that information is extensive. Each NeighborhoodScout report contains 640 statistics for any given location. With 100% seamless national coverage, users can access the most vital pieces of real estate information, including crime risk, demographic, real estate, school rating, and home value trends and forecast data. 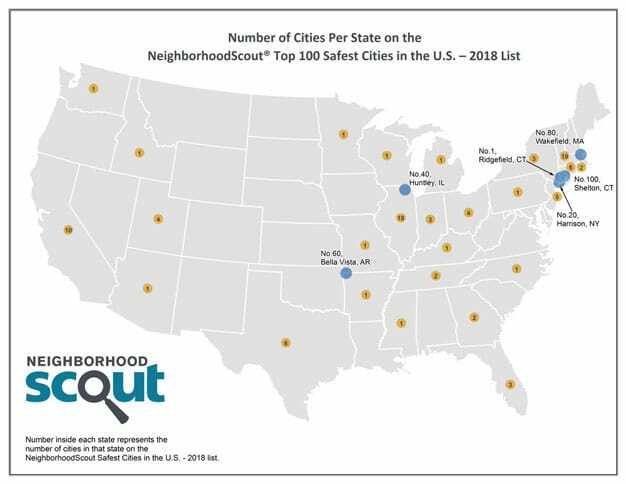 The number of cities per state on the NeighborhoodScout top 100 safest cities in the U.S. 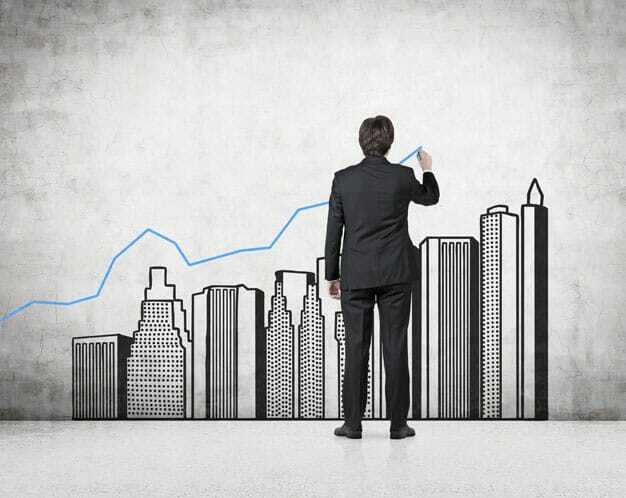 He said that, not only is it important to evaluate what a neighborhood or property looks like today, but investors should consider what it will look like in the future. The website provides predictions on crime rates for five years into the future. It also provides one- and two-year indicator trends for any region. “NeighborhoodScout uses exclusive models to track regional population growth, job growth, income trends, unemployment trends, the stock performance of the region’s industries, housing added, and vacancy trends,” according to information provided by Schiller. He said another fundamental underpinning of real estate value is access to high-paying jobs. NeighborhoodScout provides calculations for the number of high-paying jobs within five minutes, 10 minutes, 15, minutes, 20 minutes, 30 minutes, 45 minutes, and 60 minutes of the 218,000 micro-neighborhoods in the country. He said neighborhoods in the exurbs — a region, generally semirural, beyond the suburbs of a city, inhabited largely by upper-income people —at the tail end of real estate expansion in a region — will lose value quicker in a downturn. This is because although crime rates may be low, the neighborhoods in the exurbs are often the furthest from high-paying jobs. Demographic trends — how a population changes over time — is another important factor to consider, Schiller said. And, generally, investors and businesses benefit from knowing the demographic makeup of a particular region; is it made up of a student population, families, young professionals? These are just a few of the important factors that go into making real estate decisions. 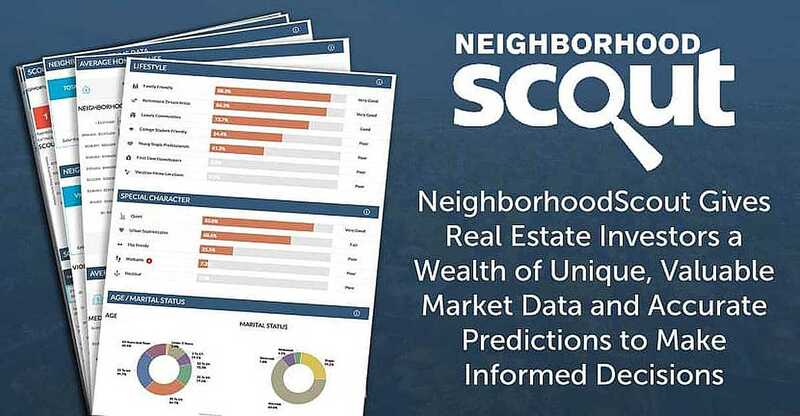 NeighborhoodScout provides all of this and hundreds more data points, going down to a hyper-local level, including the lifestyle trends, average ages of homes, rent vs. own ratio, commute times, and much more. He said NeighborhoodScout offers a Blue Chip Index to rate a property on a scale of 1 to 5. 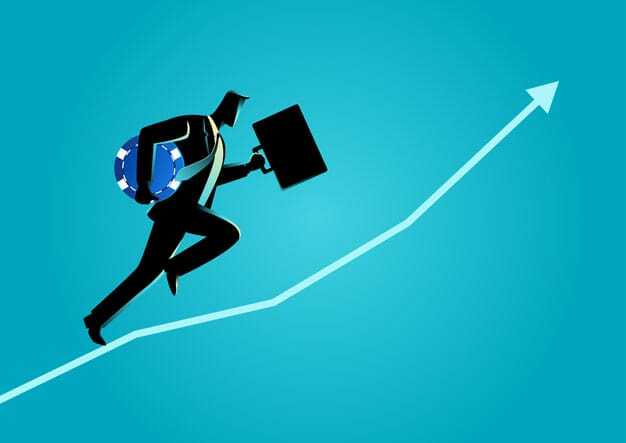 The website bases its ratings on data for the previous 10 years, taking into consideration past appreciation and existing fundamentals, to indicate resistance to future value declines. NeighborhoodScout’s Blue Chip and Rising Star indices rate areas on a 1 to 5 scale. “To get that blue chip property, you generally have to pay for it up front, but, with its proven record of holding its value, investors can go into these types of deals with a bit more confidence,” Schiller said. Additionally, NeighborhoodScout provides what Schiller calls a complimentary rating called the Rising Star Index for micro-neighborhoods. The Rising Star Index is also based on a 1 to 5 scale. He said these ratings provide crucial information for long-term investors. Schiller said that most of NeighborhoodScout’s clients are using its data over long periods of time. He said other clients include medical facilities, who use NeighborhoodScout to determine where to establish clinical labs and other services. Large retailers also use the service to help decide where to set up new locations. Real estate firms and other investors can choose from a variety of NeighborhoodScout plans. NeighborhoodScout offers a variety of different plans to suit investors’ needs. Plans begin with a “Pay as You Scout” option which costs $29.99 per report. For those interested in subscription rates, the Pro Lite plan costs $39.99 per month billed annually and allows clients to receive 10 pro reports each. The Pro plan is $79.99 per month billed annually and allows clients to receive 100 pro reports each month. According to NeighborhoodScout, the best value option is the Pro Plus plan. For $119.99 per month billed annually, clients can get 200 pro reports per month. NeighborhoodScout plans to expand its search capability offerings for 2019, Schiller said. He said this is beneficial because it can provide investors with a broader range of investment options, visualized by a heat map of areas that fit their criteria.